It was introduced in the film One Minute to Zero. 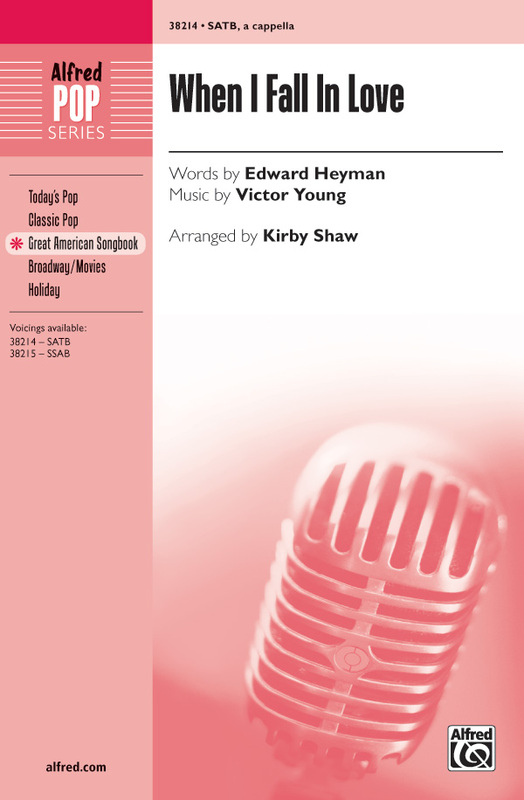 Jeri Southern sang on the first recording released in April 1952 with the song's composer, Victor Young, handling the arranging and conducting duties. The song has become a standard, with many artists recording it, though the first hit version was sung by Doris Day released in July 1952. Day's recording was made on June 5, 1952. It was released by Columbia Records as catalog number 39786 and issued with the flip side "Take Me in Your Arms". The song reached number 20 on the Billboard chart. A 1996 cover by Natalie Cole, a "duet" with her father Nat King Cole by way of vocals from his 1956 cover, won 1996 Grammys for Best Pop Collaboration with Vocals and Best Instrumental Arrangement with Accompanying Vocal(s). This great new collection lets singers become part of a full choir and sing along with some of the most-loved songs of all time. 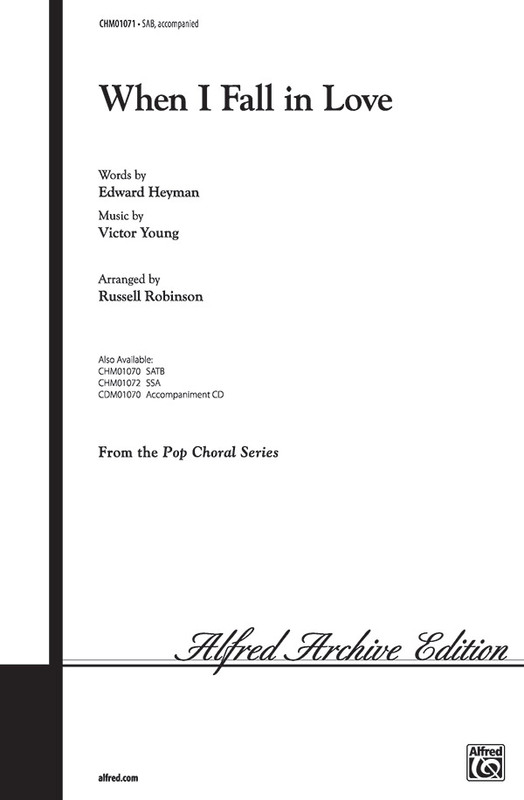 Each book includes SATB parts and the accompanying CD features full, professionally recorded performances. Now you just need to turn on the CD, open the book, pick your part, and SING ALONG WITH THE CHOIR! This collection features eight popular jazz standards. The sight of four men singing a love song to a lady is a wonderful thing. There should be much more of it! 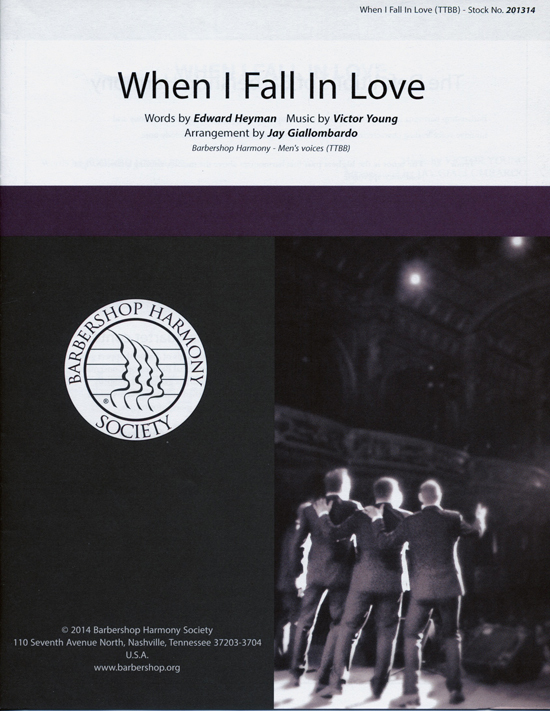 This arrangement of "When I Fall in Love" should be sung freely, with great feeling for the lyrics. There are a number of sections in which the melody is sung by a voice part other than the lead, so be careful not to obscure the melody. A fun sing! Opening with a gradually building doo-wah introduction, invite your audience to clap along while the lead sings the melody: "Hey little baby o' mine, tell me that the sun don't shine, I love you and you love me, that's the way it oughta be." "Being With You" - Gentlemen singers, you will be in the good graces of your better-half for a very long time after singing them this touching ballad! Your jazz, show, and concert choirs will all sound fantastic singing this classic Gershwin ballad "But Not for Me". This new a cappella arrangement offers beautiful lush harmonies with a female solo feature. Closes with one of Ira's most creative lyrics: "But there's no knot for me." The expressive ballad "When I Fall in Love" has been expertly arranged for a cappella mixed voices. A classic song plus a classic setting equals a memorable performance experience for all. Israel Kamakawiwo'ole's Hawaiian-style "Over the Rainbow" has become a prevalent part of today's popular music. Performed in Glee's first season finale by Matthew Morrison and Mark Salling, the unique setting has been sung by several American Idol contestants and featured in many TV shows and movies. 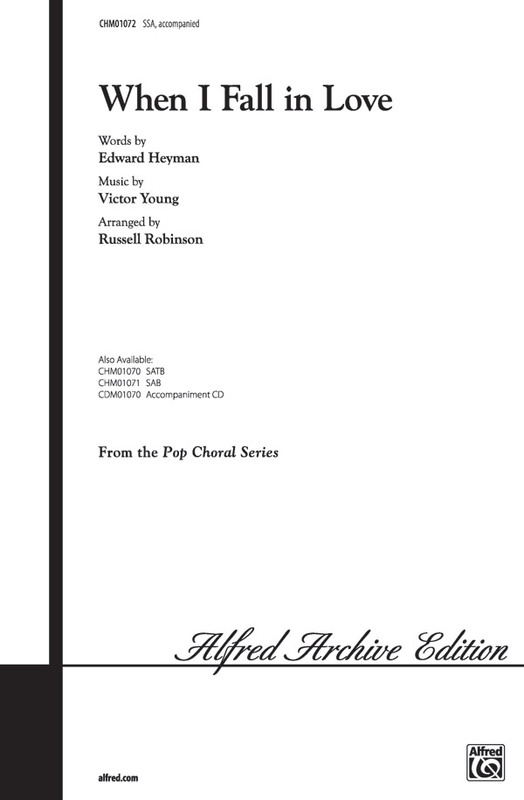 In this creative arrangement, a divisi choir accompanies the soloist, duet, or small group, performing a cappella or with optional piano, ukulele, or guitar. "The More I See You" - Originally released in 1945, this standard continues to touch hearts. Langford's advanced vocal jazz setting, dividing into multiple voice parts, really brings the melody and lyrics to life. Worth the rehearsal time! "Someone to Watch Over Me" - Originally written as an up-tempo number for the musical Oh Kay!, Ira convinced George that it was better as a ballad. The lush, challenging harmonies in this arrangement prove that Ira was right! Nine timeless vocal standards are presented in this collection in the style of the great Barbra Streisand. The CD features example and backing tracks for each song. Features 43 of the best songs from this beloved sibling duo, including classics such as: Bless the Beasts and Children - (They Long to Be) Close to You - For All We Know - Goodbye to Love - Hurting Each Other - I Just Fall in Love Again - I Won't Last a Day Without You - It's Going to Take Some Time - Let Me Be the One - Merry Christmas, Darling - Please Mr. Postman - Rainy Days and Mondays - Sing - Solitaire - Superstar - There's a Kind of Hush (All Over the World) - This Masquerade - Ticket to Ride - Top of the World - We've Only Just Begun - When I Fall in Love - Yesterday Once More - and more. Includes two tables on contents: one alphabetically by song title, and one chronologically by album. Celine Marie Claudette Dion is a Canadian singer, occasional songwriter, actress, and entrepreneur. Born to a large, impoverished family in Charlemagne, Quebec, Dion emerged as a teen star in the French-speaking world after her manager and future husband Rene Angelil mortgaged his home to finance her first record. In 1990, she released the anglophone album Unison, establishing herself as a viable pop artist in North America and other English-speaking areas of the world. Celine's first published folio provides an excellent encapsulation of the songs that propelled her to stardom. Ten familiar classics as Linda Ronstadt would perform them are showcased in this vocal book with a CD that features two tracks for each song - one example vocal track, and a separate backing track. Whether you're a karaoke singer or preparing for an audition, the Pro Vocal Series is for you. The book contains the lyrics, melody, and chord symbols for eight big screen hits. The CD contains demos for listening, and separate backing tracks so you can sing along. The CD is playable on any CD Player, and it is also enhanced for PC and MAC computer users so you can adjust the recording to any pitch without changing the tempo. Sam Cooke, was an American gospel, R&B, soul, and pop singer, songwriter, and entrepreneur. He is considered to be one of the pioneers and founders of soul music. Cooke had 29 Top 40 hits in the U.S. between 1957 and 1964. Major hits like "You Send Me", "A Change Is Gonna Come", "Chain Gang", "Wonderful World", and "Bring It on Home to Me" are some of his most popular songs. Cooke was also among the first modern black performers and composers to attend to the business side of his musical career. He founded both a record label and a publishing company as an extension of his careers as a singer and composer. Broadway, blues, folk, jazz, gospel, country, and soul are represented on the remarkable album Sam Cooke at the Copa. This album-matching folio includes eight pages of biographical and historical information about Sam Cooke during his time at the Copa. Singin' with the Big Band is an ideal opportunity for you to sing with a real big band whenever you want. This book and CD features 11 big band vocal arrangements in a variety of styles and tempos written at the medium difficulty level. Using the included CD, you sing with a professional big band to improve your vocal skills, style, interpretation, and confidence. The CD has two tracks for each song, a demo track, and a sing-along track. The demo track features a professional vocalist demonstrating the vocal part for you to listen, get some ideas, and decide how you would like to sing these great standards. The sing-along track has no vocal, so you sing with the big band. Titles: Everything * How About You? * I Can't Believe That You're in Love with Me * I Could Write a Book * I Get a Kick Out of You * I've Got You Under My Skin * Just Friends * Night and Day * Something's Gotta Give * Summer Wind * When I Fall in Love. This title is available in SmartMusic. 100 timeless hits from the silver screen are showcased in this massive collection of classics in arrangements for piano, voice and guitar. Songs include: Alfie - Because You Loved Me - City of Stars - Come What May - Don't You (Forget About Me) - Endless Love - Eye of the Tiger - Flashdance...What a Feeling - Happy - I Am a Man of Constant Sorrow - Let It Go - Moon River - My Heart Will Go On (Love Theme from 'Titanic') - New York, New York - Over the Rainbow - Puttin' on the Ritz - The Rose - Singin' in the Rain - (I've Had) the Time of My Life - Up Where We Belong - The Way We Were - The Wind Beneath My Wings - You've Got a Friend in Me - and more. 464 pages! 83 songs of love and devotion: All I Ask of You - Canon in D - Don't Know Much - Endless Love - Here, There and Everywhere - Love Me Tender - My Heart Will Go On - Somewhere Out There - Wedding March - You Raise Me Up - and more. Each songbook in the Big Book series provides musicians of all ability levels with a big list - usually 40 or more titles per book - of the very best songs from a favorite musical genre. Weddings are cherished celebrations. Now the Big Book series introduces some of the most cherished love songs of all time. Reminisce about old memories or create new ones with these romantic classics. Songs include: Ave Maria - Come Rain or Come Shine (Frank Sinatra) - The Greatest Love of All (Whitney Houston) - Lost Without You (Delta Goodram) - Now or Never (Josh Groban) - This I Promise You (Richard Marx) - Valentine (Jim Brickman and Martina McBride) - With this Ring (Kenny Loggins) - and many more. A beautiful collection of 59 pop standards perfect for wedding ceremonies and receptions, including: Against All Odds (Take a Look at Me Now) - Always and Forever - Amazed - Beautiful in My Eyes - Can You Feel the Love Tonight - Endless Love - Forever and Ever, Amen - Give Me Forever (I Do) - Grow Old with Me - Love of a Lifetime - Never Gonna Let You Go - Open Arms - (I've Had) the Time of My Life - Unforgettable - The Vows Go Unbroken (Always True to You) - When I Fall in Love - The Wind Beneath My Wings - and more. From standards to pop to country, this collection spans generations and genres to include the perfect song for any couple's big day. 64 songs, including: At Last - By Your Side - Can't Help Falling in Love - Faithfully - From This Moment On - Hungry Eyes - I'm Yours - In My Life - Just the Two of Us - Love Is Here to Stay - Make Someone Happy - Making Memories of Us - My Cherie Amour - Perhaps Love - Someone like You - Till There Was You - To Make You Feel My Love - The Way You Look Tonight - When I Fall in Love - When You Say Nothing at All - and many more. Revised and expanded collection of wedding songs for the singer. Including Classical/Traditional, Broadway, Standards, Pop/Rock Classics, and Contemporary Christian. Available in 3 versions: High Voice, Low Voice, and Duets. The same 59 songs are in the high and low voice editions. Revised and expanded collection of wedding songs for the singer. Including Classical/Traditional, Broadway, Standards, Pop/Rock Classics, and Contemporary Christian. Available in 3 versions: High Voice, Low Voice, and Duets. The same 59 songs are in both the high and low voice editions, including: Classical/Traditional songs. How many times have we heard women pop singers complain about the printed keys of standard songs? "They're too high for me!" is the predictable comment. Here's a new collection that addresses that concern, transposing great songs down into a comfortable belting range. Jay offers a fresh, swingin', positive, and happy approach to this popular standard, originally sung by Doris Day in the '50s and later by many other pop and jazz artists. Great for concert, jazz, and show choirs. This expressive ballad has been expertly arranged for a cappella mixed voices. A classic song plus a classic setting equals a memorable performance experience for all. This expressive ballad has been expertly arranged for a cappella women's voices. A classic song plus a classic setting equals a memorable performance experience for all. This arrangement should be sung freely, with great feeling for the lyrics. There are a number of sections in which the melody is sung by a voice part other than the lead, so be careful not to obscure the melody. A fun sing! From the fifties to the nineties, this classic pop standard keeps finding its way back among the best hits of today. Russ Robinson's fresh new setting will delight any pops concert.